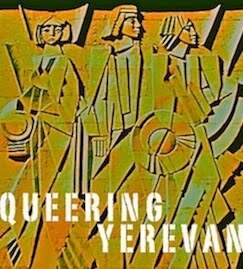 Barbara Eder: Please tell me more about the history of Queering Yerevan. I am especially interested in the role collectivity plays in the process of producing art. Does collectivity mean to extend the limits of individuality? Is it also a way to gain more power in public action? 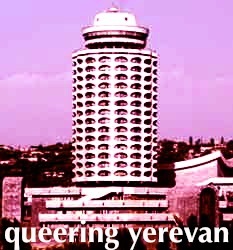 Queering Yerevan: The QY Collective has named and defined itself variously since 2007, when a group of artists, writers, cultural critics and activists started to collaborate with each other in various forms to mainly “queer,” de-automate, subvert, and use the capital of Armenia, Yerevan, as an experimental space for new cultural production. From the very beginning, the task of the collective has been to disturb habitual perception by rendering the familiar in unfamiliar terms in order to slow down automated perception. A QY act, in other words, is a form of slant activism, which differs from conventional acts of intervention that use direct or straightforward language to get across a certain message, or elicit a specific response. Yes, working in a collective means to push the limits of individuality and always be cognizant of the dynamic of its members and their different approaches to achieving the same goal—the cultivation of a queer gaze. We strive to create and inhabit spaces that do not homogenize and that do not thrive on inertia but spaces that host encounters with strangeness, the unconventional, something beyond the norm. 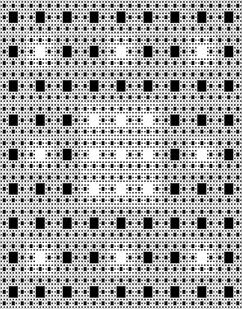 So maybe the collective form (versus the individual form) is not so much a way to gain more power in public action as it is a way of diffusing the collective energy into fractals, it’s a way of re-publicing and re-re-publicing the spaces in which we live and work. Our first happening titled “Coming to You to Not Be with You” took place in 2008 in the garden of 34 Zarubyan Street, which became a space for future gatherings and happenings. The garden was a private space shared by two non-governmental organizations, the Women’s Resource Center and the Utopiana Cultural Center, which we turned into a transitory station for art events and public discussions. 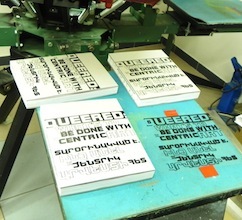 In 2011 QY published its first book, Queered: What’s To Be Done With Xcentric Art, which includes documentation from various acts and art happenings, photography, critical texts, excerpts from experimental writing, fragments from the QY blog, and email correspondence between 2007-11. We are currently working on our next book titled “In and Between the (Re)public,” which was funded by Prince Claus and which is scheduled to come out in early June. BE: To become visible through art can be a more subtle strategy than political activism. Would you draw any distinction between both concepts, are they intermingled? QY: Actually, a lot more can be done through anonymity and invisibility. We try not to erase our individual names but more often than not we find ourselves interacting with and agitating the public in modes of communication that require anonymity (such as stencil art or graffiti). For example, we have been stencilling the verses of socialist feminist poet Shushanik Kurghinian (1876-1927) in the entrances of multistory buildings in Yerevan within the frames of our latest project (In and Between the (Re)public). These are neither private nor public spaces—they are hallways, stairwells, corridors, passageways that connect or lead from the public to the private and vice versa. So someone taking his child to school one morning might see the following verse on the interior wall of the building’s entrance: “I am the one, buoyant and rebellious, who stayed with you . . . ” Or someone coming back from work might encounter a line like this: “A curse on the generation still creeping in serfdom!” Or yet another person reading the following on his way out: “But just one bright ray? O, sirs, that’s not enough!” These words appear in unanticipated places, they are taken out of their context and yet they address each and every one of us as members of a public who are subjects of a republic governed by anti-public politicians and administrative incompetents. So in this case we thrive on anonymity and we also protect ourselves from being charged for “property damage.” As Lana Wachowski says, “Anonymity allows you access to civic space, to a form of participation and public life, to an egalitarian invisibility.” So the Collective has been moving away from visibility and individuality to more civic-oriented art forms and strategies that diffuse and fragment perception in subtle ways. BE: How do you define the term “queer” or “queerness”? Is there a significant shift in the meaning when using it in the Armenian context? BE: A lot of your actions take place in public—also to reclaim space for LGBTI people. Please tell me more about your last action. The Republic has been hegemonically designated as singular – both in form and in content. There is the Republic – the idealized structure of modern statehood to which all nations must aspire. And there is the Republic, “our” nation, “our” people as one collective body (fascism propagated by slogans such as “One nation, One culture” that canonize the “proper” and regulate possibilities within a cultural landscape). Within both singularities of the Republic, any notion of “public” is rendered meaningless through an oligarchy’s appropriation of the commons, forced mass migration, unprecedented levels of unemployment, and the draining from the population voices of resistance. But (r-e)-p-u-b-l-i-c-s are also in and between language that separates rather than unites, that foreignizes rather than domesticates. And there is, of course, time and displacement—as modernity epitomized by the concept of “now” is also characterized by forceful and constant revisions. Within this “new” era of “Republicanism” and “Democratization,” how can we discuss the specificity of the impact on bodies, on language, on memory, and the interfacial affective realm of the (virtual) embodiment of inbetweenness? How can the publics (de)scribe and reinscribe spaces through which to continue meaningful production of disc(our)ses? So one of the happenings of this project was a tree-planting in the semipark located at 26 Baghramyan Avenue, in the corridor between the Presidential Palace, the House-Museum of the poet Silva Kaputikyan and Lovers’ Park. The semipark is often a gathering place for radically different contingents such as police officers who guard the Presidential Palace or hang out and smoke, homeless people who sleep on the benches, and children who like to play there. But the semipark actually belongs to the community living in the adjacent building. In other words, the semipark is both a privately-owned space and a public space. Not completely private and not completely public. The action draws attention to the communities undergoing gentrification via the illegal privatization of public areas where the new owners cut down the trees and build expensive cafés or elite housing at the expense of those who previously inhabited those spaces. We had specifically chosen to plant the Cercis siliquastrum commonly known as the Judas tree, symbolizing treachery and simultaneously repopulation of the social spaces of the evicted populace. BE: The documentary material of your actions also contains photos, which guarantee a high dregree of personal identification. I find that very courageous! What is the price that one pays for being out of the closet in Armenia? Does your work somehow influence those, who are still closeted? QY: From the very beginning we have been extremely keen on queering heteronormativity and creating spaces for the non-hetero communities, which implied that we could not function in the previously known modes of non-hetero anonymity and the closet. In other words, yes, it became crucial to undergo a process of naming and identifying oneself and discovering the community that had been silenced by laws, traditions, families, customs, and religions. We can’t know yet if our work has changed the lifestyles of other people however we do hope that we have created the kind of tension that forces anyone to start noticing or experiencing things from another (a stranger’s) perspective. And by that we don’t mean a touristic or tokenizing experience but a truly unsettling experience where one lets go of comfort in order to engage in something other than what one is used to or is comfortable with. We explore this, for example, using the concept of migration. We engage with the question of migration as a physical as well as cognitive movement from a fixed (known) reality to a changing actuality, from a grounded, rooted community to a routed one. Is leaving one’s own immovable “home” as joyfully confounding or explosively estranging in a post-independence Armenia today as it was a century ago, in colonial (Russian) Armenia, when agents of dissident ideologies moved from their apartment floor plans to the map of the world? What happens to the material debris abandoned at home? Could it be that the things that, in the past, made one sick of home will frame the homesickness of the future? (See QY’s installation “Caution: People Crossing Border,” 8th Gyumri Biennale of Contemporary Art). 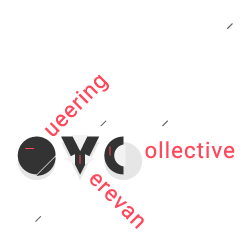 BE: Finally, I would like to know more about the next actions of Queering Yerevan Collective . 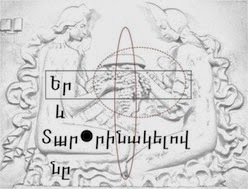 . .
QY: As mentioned earlier, we are working on the book cataloging the happenings from “In and Between the (Re)public,” which we hope to present in Yerevan and in Tbilisi (and maybe elsewhere) in August. Our presentations are usually interactive, we dialog with the audience and we also often incorporate performance acts, so we are in the process of conceptualizing these happenings. 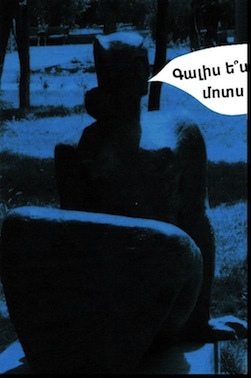 Արփի Ադամյան. Օրինակ, մենք ունենք մի օլիգարխային կերպար, մեկը, ով բարգավաճում է կեղծավորության ու խարդախության հիման վրա . . .